This refreshing, non-foaming cleansing milk is enriched with the goodness of sandalwood, almond & Indian Burberry extracts. It deep cleanses, nourishes and heals the skin. Used in a variety of ways, it can help balance oil secretion, dryness, pimples and dark circles. This nourishing cleansing milk is enriched with the goodness of almond & Indian berberry extracts and sandalwood oil that cleans, nourishes and heals skin in one sweep. The texture of the cream is very light so it doesn't feel greasy on the skin. It effectively removes makeup, dirt, and impurities from the skin. 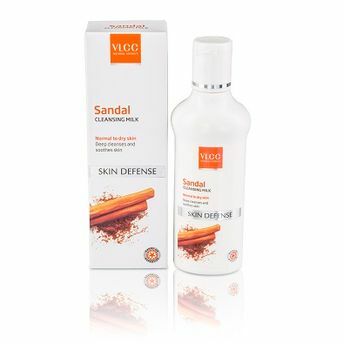 Enriched with Indian Berberry and Almond extracts it provides moisturizes skin, nourishes it. Has the ability to heal your skin and make it soft and supple. Additional Information: With the motto of Transforming Lives VLCC aims to spark self-transformation, spread happiness and imbibe every individual with wellness. It is widely recognized for its therapeutic approach to beauty and weight loss solutions. Started in 1989, VLCC has now expanded its horizons to skincare, hair care, body care, functional foods and fortified foods products. Explore the entire range of Makeup Remover available on Nykaa. Shop more VLCC products here.You can browse through the complete world of VLCC Makeup Remover .